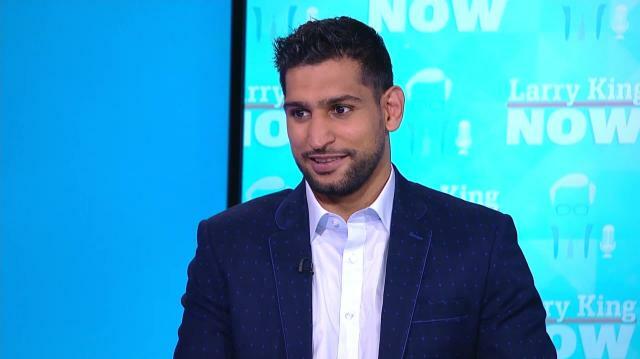 Famed British boxer Amir Khan weighs in on the upcoming Mayweather vs. McGregor bout, telling Larry he expects the fight to be a "walk in the park" for Floyd Mayweather. Amir Khan: Which is Floyd Mayweather. Now, I don’t think he has a boxer’s chance. If it was an MMA fight, then you know, anything can happen. He might hit Floyd down. He’d win. Larry King: Not once he knocks him down. Amir Khan: Then he’s done. So, being a boxing fight, I think it’s all Floyd. Floyd’s just going to walk right through him, he’s going to make him look...He’s going to make him miss ‘cause Floyd’s defense is amazing as well, he’s not going to get hit with anything. It’s going to be a nice, easy walk in the park for him.